Bridge reporter Jim Malewitz hosts a panel on the future of Michigan's natural resources at our 2018 Michigan Good Government Solutions Summit on March 14, 2018. As climate change and rapidly changing industries create fault lines over Michigan’s natural resources, experts are looking for sustainability both in business and in state environmental policy. It’s a tension, state environmental experts agree, that can be made more difficult by legislators who are term-limited. The list of needed solutions is long. Disease among deer threatens hunting, which could lead to a decline in funding for conservation; coal-fired power plants are shrinking, leaving a higher energy need; and residential electricity rates are higher than most states. Michigan’s prized lakes and rivers, meanwhile, are being polluted in spots with toxic chemicals and sewage while communities statewide face continued challenges to drinking water safety. 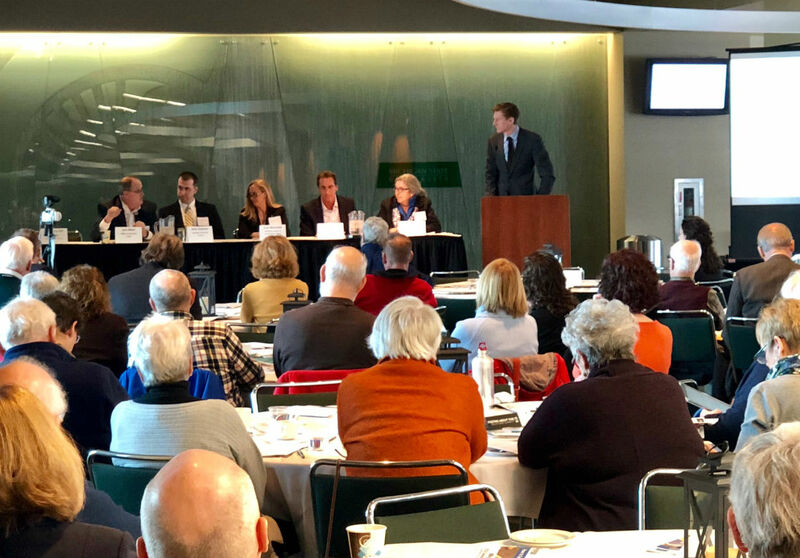 Panelists convened in East Lansing Wednesday to discuss possible solutions to these problems during the Center for Michigan’s Solutions Summit. Michigan Chemistry Council Executive Director John Dulmes, Project Director for the Detroit Climate Action Collaborative Kimberly Hill Knott, President of the Michigan Environmental Council Chris Kolb, State Director of the Nature Conservancy Helen Taylor and Executive Director of the Michigan League of Conservation Voters Lisa Wozniak joined Allan. Knott said the state should be partnering with local government to find creative strategies to reduce the impact of climate change on cities, which include higher rates of flooding and higher temperatures in the summer. Aging infrastructure and unaffordable water become an economic and a health burden. “When you get into those issues you really get into economic issues, bread and butter issues,” she said. Citizens are willing to pay to make changes to protect against climate change, Taylor said. And the business community is learning that sustainability is a business (as well as philanthropic) imperative. “Ultimately it requires investment and leadership to look at the long term,” Taylor said. Communities must be resilient and not depend on the federal government, said Allan and Kolb. Kolb said the legislature is not prioritizing funding to protect natural resources, and Wozniak said “no one’s talking about a Marshall Plan for water,” a nod to Gov. Rick Snyder’s “Marshall Plan for Talent” proposal. “The public will is growing and if leaders and willing to lead, i believe the citizens are there to support them,” Wozniak said.